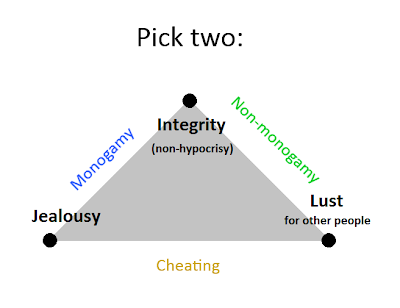 My theory of people is that most aren't naturally mono, or naturally poly, but naturally hypocritical. While many mono people genuinely feel no desire for other partners, many - perhaps most - suppress this desire because they think this is expected of them, and also because they couldn't handle their partner having such a desire. While many poly people genuinely feel no jealousy about the romantic and sexual actions of their partner(s), many - perhaps most - strive to overcome this jealousy because they recognize their own desire to be with other people, and wish to extend the same freedom to their partner(s). Spoiler alert: If you haven't seen Breaking Bad up to and including Episode 1 of Season 3, stop reading here. Okay, so in October I wrote a fairly scathing criticism of Breaking Bad. It was when Jana and I got stuck, and just couldn't keep watching when it looked like Mr. White was going to have another completely unnecessary episode of madness, and burn all that money he had made. Several months later, we finally mustered the willpower to keep watching, and we were blown away. Season 3 definitely exceeded our expectations. We are now at Season 4 and loving it. The main characters, White and Pinkman, remain hateable - but the script is much more fun than we expected it would be.